My introduction to Edmund Battersby was a two-disc Naxos set, reviewed in Fanfare 29:3, featuring two versions of Beethoven’s Diabelli Variations. On one disc, Battersby performed the work on a 1997 replica of a Conrad Graf piano from 1825 (from the shop of R. J. Regier in Freeport, Maine), and on the other disc he played the piece on a 1976 Steinway Model D. That release so impressed me that when the opportunity arose to interview this very busy artist who doesn’t usually do interviews, I jumped at the chance. Battersby holds undergraduate and graduate degrees from Juilliard and, in addition to his extensive concertizing activities he is Professor of Music at Indiana University’s Jacobs School of Music. As a performing artist, he has distinguished himself in repertoire ranging from the early Romantics to the music of a number of major 20th-century composers, having appeared in live and recorded performances led by Messiaen, Crumb, Rochberg, and Bolcom. And, just as smartly as Battersby wears his early 19th-century cravat and greatcoat in performances on fortepianos of the period, he is equally comfortable in his less frilly and less formal 20th-century attire commanding the keyboard of a modern concert grand piano. American Record Guide claimed that his aforementioned landmark recordings of Beethoven’s Diabelli Variations on modern and period instruments put Battersby, “in the company of Brendel, Serkin, Schnabel, and Pollini.” But even before Battersby’s Beethoven effort for Naxos, music lovers will remember the pianist from recordings for the Musical Heritage Society. Two previously unavailable MHS recordings— “The Early Romantic Piano,” reviewed below, and Mendelssohn’s complete Songs Without Words—have been released on a new label, Schoodic Sound, which, I’m given to understand, takes its name from the Schoodic Peninsula in Maine. Also reviewed below is a brand new recording on Schoodic Sound of Albéniz’s Iberia, Books 1 and 2. Books 3 and 4 slated to follow in short order. 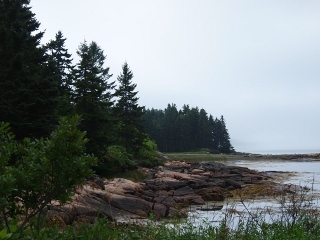 Q: Let me ask you first about this venture with Schoodic Sound. In addition to “The Early Romantic Piano” disc of works by Chopin and Schumann and Books I and II of Iberia, both of which were sent to me for review, I understand that the new label will also be releasing a Schubert CD and the completion of Iberia. What else can you tell us is in the pipepline? A: Well, maybe Schubert will be the “bookends” of my recording career. The Schubert release you have mentioned will actually be a re-issue of my first solo recording, a disc of Schubert Klavierstücke, commissioned and recorded by MHS in 1978. But you are prescient to mention Schubert, because in the back of my mind for many years now I have wanted to record the Schubert sonata canon, including fragments, some of which are startlingly progressive, on the Graf and maybe a c. 1815 Viennese piano. I have not yet decided if this will be a “comparison” project as the Diabelli was, but it may very well become that large a project since I have an anathema to assigning repertory to a single instrument relating to the period of the composition. The whole thrust of my work both as a performer and a teacher has been hopefully to go a step further, possibly since I have been an educator as well as a pianist for so long, to use the old pianos as a “research” tool, almost a laboratory for bettering our translation— for that is what it is—on the modern piano. To approach the Schubert sonatas from this standpoint would be a very different task than exploring Beethoven’s. Beethoven’s sonata journey represents nearly a “diary” of the development of the piano up to the end of the 1820s. Schubert’s is less of an enormous task and starts really about midway in the instrument’s development. Generally 1830 is the dividing line for speaking of early pianos versus modern. By then, except for Graf, iron was introduced into piano building everywhere and by mid-century and a bit beyond, differences with the piano of today had more to do with voicing and other refinements rather than basic structure. But if I may go on from this, the question has become, with the intrusion of the early instrument movement, “are the great composers of the classical period as abstract as we formerly thought, or did “sound” become as important as “content?” Of course this is not even debatable once we get to Chopin, but keen observers of the early piano movement will undoubtedly tell you that the glimmers of Chopin in late Beethoven and then Chopin’s appearance on the scene are not so unexplainable as a segue when one takes a look at the progress of instrument making. Another question to ask along these lines would have to do with register breaks, once a valued part of the instruments, which gave way over time to priorities of smoothness between registers. It just so happens that these fleeting moments in Diabelli put a whole different sense of how the music moves. That there is rarely a variation that does not take advantage of these enormous contrasts, the whole sense of movement has been greatly increased. There is always some change occurring in the sound, but the modern piano cannot offer the same diversions. Perhaps this is why the Diabelli may never make it as a repertory piece except for connoisseurs? Q: Since you’ve mentioned your Diabelli recording for Naxos—which, by the way, I reviewed to high praise in issue 29:3 of Fanfare—I can’t help but note that I’ve just reviewed a 1976 recording released for the first time on CD by Eloquence of the “other” Diabelli Variations, performed by Jörg Demus on two different instruments, a Johann Georg Gröber, built sometime between 1815 and 1825, and an 1802 Broadwood. Unfortunately, not all 50 variations by those “other” composers will fit on a single disc, so Demus plays 31 of them. If I’m not mistaken, I think Rudolf Buchbinder, once upon a time, recorded the whole lot on an LP set, but I’m pretty sure it was never transferred to CD. Wouldn’t this be an absolutely perfect sequel to your Beethoven Diabelli set? A: Back to Schubert and my first recording for MHS: I recorded the very touching Schubert “Diabelli” Variation from that set of 50. I think that the Schubert variation is one of the only good little pieces in the whole collection, but I seem to remember that the young Liszt wrote quite a good one. When I was just at the end of my Juilliard studies I read an interview someone did with Rubinstein where he said he never played a note of music he did not love, and from that moment on I decided that I wanted to only learn and perform music (solo) that I fiercely believed in and loved and I think I have stuck to that personal rule during my career. In any case, with only two other “Diabelli” variations I could identify with, that is a project I had best leave to others! Funny and peculiar regarding that Schubert recording: it would never have been made had I not been true to my decision. Herb Axelrod got me those original MHS contracts, and I proposed Schubert G-Major and C-Minor Sonatas. Jeff Nissim said no to that and said he wanted me to do modern American piano music, “not already in their catalogue.” Nothing against modern American piano music, but I decided I had to turn it down as I had already played a lot of new music with the Aeolian Chamber players and it was the Schubert anniversary year. That was the music with which I felt the most resonance. It was a tough and cheeky thing to say no to a first solo recording. I was very surprised when Nissim’s office called and said okay, and that I should pick a bunch of short Schubert pieces, “not already in our catalogue!” Therefore, the music on that album is pretty far-flung, unknown Schubert! Q: I notice on your “Early Romantics” disc that you play a copy of a Conrad Graf piano by R. J. Regier. Is it the same Regier “Graf” you played for the Beethoven Diabelli CD? Tell me about the instrument and its maker. A: Same maker, different instruments. Graf may best be described as the Steinway of his time. By the 1820s his instruments were the preferred piano of Chopin, Liszt, and Clara Schumann. Schubert, as best we know, never owned a piano, but the Graf would have been part of most Schubertiades. By the way, when Chopin was in Paris, he preferred Pleyel to Erard and he made that choice because it reminded him of the Graf pianos he knew in Vienna. This is documented! It is safe to say that his op. 10 Etudes were born of his Graf experience. The instrument, which spanned 6-1/2 octaves, was known for its beautiful transparency, silvery quality in the upper register, and flexibility in accommodating a wide range of dynamics and textures. R.J. Regier by 2012 has been recognized worldwide as the foremost maker of the larger post-Classical pianos, or “fortepianos” as they are unnecessarily called. One has to keep in mind that in Russia and Poland, the modern piano is still called a fortepiano! An article in the New York Times some years ago referred to Regier as the “Bees’ Knees” of replica makers, and I think that assessment has only grown, since his pianos are found to be active members of the instrument families of Harvard, Cornell, Yale, Indiana, and soon the Juilliard School. Whoever would have thought that the last named, and my alma mater, would ever have considered it important to have one? Truth be told—so that we don’t think that interest in historical pianos has begun in our time—Lonny Epstein, assistant to Carl Friedberg and then a Juilliard piano faculty member for many years, owned, played, and recorded in the 50s a 1790s replica instrument. I don’t believe that she formally used it at the Juilliard School, but there is a connection there. My hope is that these instruments do not become solely part of Early Music Studies, but somehow find their way into the mainstream. Since I am on the piano performance faculty of the Jacobs School of Music at IU, not the Early Music Faculty, I must say that it has helped to lessen the polarization (for those who have not been aware of the sometimes brutal response a few decades ago about the period instrument movement, things have calmed down considerably). I must say that my illustrious colleagues are not only accepting, but often fascinated, which of course filters down to our students. Anyway, Regier has worked out of Freeport, Maine for 30 years (his shop attached to a barn and farmhouse with acreage, not part of L.L. Bean’s (!)). He has had an advantage over other makers, some who are very, very good, because he graduated with an engineering degree from MIT, is an outstanding fine-woodworker, a one-time harpsichord student, and rather a perfectionist! Any two of those advantages should ensure a good maker, but all four? There you have it. I met Rod in the early 70s when he married Shirley Mathews, certainly a leader in the revival movement, who taught at Peabody. The instrument I used for the 1986 recording to which you referred was his first produced instrument, and I believe Anthony Newman christened it with his Beethoven 3rd Concerto recording before I had the chance with it. The instrument of his which I used for the Diabelli, nearly twenty years later, resided at Cornell and was actually lent to me by my longtime friend and generous colleague Malcolm Bilson. The technician, Rob Loomis of Boston, carted it up to Toronto, fought with customs both ways and cared for it wonderfully, knowing both my and Bilson’s priorities. Q: What is it like to switch back and forth between an early 19th-century instrument and a modern grand? What are some of the differences in terms of range, control of dynamics, and keyboard action? What adjustments do you find yourself having to make? connection musically. Early 19th century pianists dealt with problems of control and the fact that the hammer moves so swiftly. The greatest advantage of this in music making is the resulting directness of the sound. It is immediate, comparable to the contact other instrumentalists have with their instruments. On the modern piano it would be interesting to measure the actual delay and time it takes for finger to key and hammer to string. I think that this is the largest difference in the instruments. Somehow, the greatest pianists of our times have solved this problem of immediacy, maybe unwittingly. Chopin spoke of connecting the live finger to the dead mechanism, and listeners and critics have spoken of pianists who sound as if nothing is between their fingers and the strings. For me, that is the magic of great piano playing. Of course, there are more scientific and acoustical reasons that have to do with intervals and voicing. For instance, it is nearly impossible to “top voice” a melody, all the parts of the music assume their proper place but are definitely NOT subservient to the top voice, partly because of the absence of crossstringing, partly because of the lack of intervention of iron bracing, and partly because of the striking points of the hammer on the string. This changes with most every make of piano, old or new, but in the period instruments it was quite different. No dissonance can be as expressive as that heard on a period instrument. The different striking points of the hammer to the string and resulting overtones sprung, increase the “conflict” of close intervals. To my mind, back to Goethe, if you know that a sound is possible, that is the beginning of finding it. Not that we are looking to “imitate,” God forbid, but simply to try harder and to use more imagination and therefore add more dimensions to what we are doing. I guess I think that the modern piano has more to offer us than we are generally willing to seek out. Busoni, who was a very “modern” pianist, said that we must believe that anything is possible on the piano. This of course had to do with really conceiving in the brain what one wants to hear. Hearing is believing?? Q: What do you think is lost and gained in playing works by the early Romantics on modern instruments? A: It’s a strange thing, but in many ways it’s the limitations of period instruments that add to the music, and it’s the virtues of the modern piano that somehow detract. I will simply say here that it is a problem of aesthetics. For many decades, the Schumann aesthetic has been for pianists the thick sonority of the scores as the modern piano encourages. Actually Schumann was more an orchestral thinker on the piano, as opposed to Chopin, but both were truly great contrapuntists, if not in the strict sense. Therefore, what I think is lost, unless the player has really taken it into account, and we do have some players who address this, is the need for greater transparency. Again, achievable, but it takes a lot more work. It would be silly to say that one cannot glean this except from interaction with period instruments. Starting in the ‘70s when European and Asian pianos appeared on the scene in the United States, one noticed a difference in the lighter sound and faster actions. I would say that this has also been a factor in transforming the pianist’s aesthetics, but by no means has it changed for everyone. The influence of the period instruments is still modest and thought to be more extreme. I remember when I decided to record Schumann on the Graf, everyone thought I was crazy. Twenty-five years later things have changed enough, not that it is commonplace, but it certainly would not elicit raised eyebrows now. Q: Speaking of the early Romantics—I guess this is just my own personal take on it— I generally think of composers like Schubert, Weber, Reicha, Hummel, Spohr, Onslow, Czerny, Moscheles, Rossini, and so on, as fitting that label. In other words, composers mainly born in the late 1700s, but who, in some cases, lived far into the 19th century. Stretching the timeline a little, I suppose I’d admit Chopin, Mendelssohn, and Schumann, all three of whom were exact contemporaries born in the first decade of the 19th century. But somehow, it’s hard for me to think especially of Schumann as an “early” Romantic, I suppose because his musical language, approach to form, and literarily/programmatically based works are already so deep into the Romantic aesthetic. If musical Romanticism has an early, middle, and late period, to my mind, Schumann would fall into the middle period. Yet you’ve included his Kreisleriana, admittedly one of his earlier works, on your “Early Romantic Piano” disc. Would you comment on this? A: You are certainly correct. When we chose that title for the album, we were really thinking of the date of the instrument, c. 1825, rather than the date of the music. We didn’t feel historically inaccurate since Schumann had a Graf presented to him and Clara for their marriage in 1840. Chopin was playing Grafs in Vienna at the time of the composition of the G-Minor Ballade. Perhaps a bit of a stretch for the Fourth Ballade, but I felt safe since by the time he was in Paris and preferred Pleyels to Erards because they reminded him more of the flexibility of Grafs. To tell the truth, I have played a few excellent Pleyels from 1839, thought they were gorgeous, but really more a modern piano with distinguishing features of sounds that were not so familiar! Q: Who were some of your teachers, and which pianists influenced you the most? A: My teachers were, in order, Barbara Holmquest, Artur Balsam (chamber music), and Sascha Gorodnitzki. I could not have been luckier to have so comprehensive an approach to music and the piano. Holmquest, certainly the least known, was a longtime pupil of Carl Friedberg and was the most imaginative and curious person and frankly an amazing pianist. You referred to me as having an unusually broad range. Well, this woman was playing the Copland Fantasy (from memory) in London in the early 60’s and the Prokofiev Eighth Sonata while recording all the Nocturnes of John Field during that same trip on the Colt Collection for Oryx. She also introduced to New York the innovative Georg Bolin piano (having appeared at the 1964 World’s Fair), which had a tiltable soundboard making it adjustable to a hall’s acoustics. Bill Evans loved this piano, which had a lot more transparency as a result of a steel frame instead of iron. As a matter of fact, he was using the piano in the village when Holmquest was to premiere it at Town Hall and wouldn’t let it be moved for her recital. A court injunction allowed the concert to take place! I was 10 when I began to study with her in Ann Arbor and learned so much from her before I left for Juilliard in 1967. As far as pianists who influenced me, or my favorite artists, early on I fell under the spell of Richter. I always wished that I had been able to hear Edwin Fischer live, a big hero of mine. Fortunately I was living in New York when one could hear Michelangeli, Rubinstein, Horowitz, Arrau, etc. and those concerts I will never forget. The music world is so different today and I’m afraid that there is no longer the same excitement about a piano recital as there used to be, except for the occasional appearance of an Argerich or Perahia. Q: In my capacity as a Fanfare contributor, I get to hear lots of piano recordings by young artists just out of the conservatory or fresh from a contest win, as well as older, seasoned players who may not be well-known in the States through recordings or live appearances. Many of them I find excellent and, in some cases, even quite exciting. Two, in particular, I’d like to mention because I think they should be of interest to you, given your advocacy of and dedication to period instruments. German pianist Hardy Rittner and Russian pianist Alexander Melinkov are both engaged in parallel projects to record Brahms’s piano works on period instruments. So far, Rittner has played an 1851 Johann Baptist Streicher and an 1850 Bösendorfer, while Melinkov has opted for a later—but still well within Brahms’s lifetime—1875 Bösendorfer. Have you heard either of these pianists? What I’ve heard to date has been quite amazing, though, ironically, perhaps, as is well documented, Brahms seems to have found these instruments inadequate in his later years, specifically requesting that a Steinway be shipped from New York for the premiere of his Second Piano Concerto. Any comments or thoughts? A: There are so many players today and I can’t really focus on the outside world as I much as I would like. The pianos they have chosen seem to be appropriate to much of the music. I’m interested to hear that Brahms requested an American Steinway. I think that Brahms’ piano playing must have changed greatly during his lifetime. The Schumann daughters complained about his thumping and roughness, but a very telling review by Eduard Hanslick of the young Brahms giving a piano recital in Vienna, in which he played Schumann’s Fantasy and his own Handel Variations, would indicate that he was a young pianist of extraordinary sensitivity and lightness. By the way, Brahms inherited the Schumann’s Graf and it can be seen and even touched at the Nationale Historische. But again, there is rather a crucial consideration that no one seems to talk about that is important to me in this whole business. Any attempt at authenticity is an approximation of the thesis presented. First, we listen with ears that have heard rock bands, semi-trucks, jet planes; in other words, it is quite impossible to duplicate a 19th century person’s aural experience. Then, if we are listening to an original piano, who knows how time has altered the original sound? If it is a replicated instrument, it is quite impossible that the choice of wood, wool and other factors can match what the early makers coordinated and what those first sounds were like. It’s a noble effort, but it isn’t quite enough just to play the instruments of the period. There are a tremendous amount of treatises that show us the “manner” of playing and values which also need to be considered. Learn from the pianos, but also, learn from the period. If a work is truly a masterwork, it simply doesn’t matter that it’s played on the instruments of its time. If it is not a masterwork, it will possibly sound better on a period instrument. At this point my own students and former students are also making forays into the recording world. Two former artist-students of mine came out with notable CDs this year, one Steven Spooner who is tracing Anton Rubinstein’s monumental repertory on CD and Archie Chen who lives in Dublin and just released a beautiful Chopin CD. Chen was just involved in a rather interesting project with BBC TV—that is, a film about the Joyce Hatto scandal. BBC hired him to record several Godowsky Etudes last summer and I am really looking forward to the release of this film. Q: Before I ask my next question, I can’t help but comment on what you just said about replicated instruments. If a recording being reviewed for the magazine is performed on period instruments, we’re expected to note that in the header to the review. Yet, a suggestion I made to our editor that we distinguish between actual period instruments and copies thereof was vetoed. The point I argued was exactly yours—i.e., that with modern copies of string instruments, for example, the woods and varnish haven’t had 300 years to age and the instruments haven’t been “played in.” Therefore, the sound can’t possibly be the same as the real deal. I’m glad to have someone of your stature and with your expertise in the field agree with me. Of course, the flip side of the argument, just to play devil’s advocate, is that a modern instrument built to replicate one built in, say, 1800, should, in theory, sound exactly like the original did when it was brand new. So, what led you to take up period instruments? A: At the time I began studies with Holmquest, she had acquired an authentic 1817 Broadwood and it was in the same room with her Steinway where I had my lessons. She would encourage me to try a piece I was studying of Beethoven on the Broadwood during the lesson, and therefore it was nothing unusual for me to deal with these pianos. There was certainly no prejudice against them as so many pianists had, nor was it a revelation to come upon them after my tastes and techniques were developed. They were always part of my life and I am sure always will be. Q: A couple of your other CDs I received, not on period pianos, were two volumes of Dvořák’s music for violin and piano with violinist Qian Zhou on Naxos. They date back to 1998–9. Am I correct to assume that Naxos was the original recording source? A: Naxos was the original source of those recordings and also the connection for my later recording of Diabelli. Q: I realize these discs go back a few years, but tell me about your collaboration with violinist Qian Zhou and how this project came about. A: Qian Zhou was a complete pleasure as was the whole process of making the recording with engineer Michael Ponder. It took place over two visits to England on the North Sea and it was great. Qian Zhou and I had met a few years earlier when we played together in the south of France at La Gesse. We enjoyed each other very much and I was happy to accept her invitation. Q: Playing solo vs. playing chamber music—how does it differ for you? Are there adjustments or even compromises you feel need to be made? A: I remember when I was a child, Holmquest explained to me that I had to begin to study chamber music because, “it is what makes artistry in solo playing.” It was decades before I understood what she meant. At this point I can always identify a pianist who has not had sufficient involvement in chamber music. I would say that it has to do with spontaneity and real creativity forced by the nature of ensemble, which of course, is flexibility. Too much flexibility is not great for a soloist, but not enough is deadly. The other advantage for pianists to study chamber music is to truly understand that making music for other instruments involves techniques that reflect the phrasing, the bow, and the breath. Unfortunately the “verticalness” and conventional approach to the piano is somewhat at odds with what the music actually does. Chamber music is mostly about compromise and solo playing is about definiteness. A bit of both helps the other. Decades ago there were chamber music pianists or solo pianists. This is more a thing of the past, which is how it should be. It is still a trick though to play chamber music with awareness of blending but keeping one’s identity and ideas as well. Like all of life and certainly performing, it’s a balance of consciousness and the sub-conscious and nourishing both sides of the brain. Q: Along those lines, I notice that all of your recordings—at least those that are listed as currently available—are either solo piano or chamber music discs. Have you done, or do you foresee, any recordings of works for piano and orchestra? A: No, I have not ventured, or been invited, into that area. I have played plenty with orchestra, especially in the earlier stages of my career but at this point most of my work is geared to recitals, recordings, and small ensemble collaborations. There are certainly some projects that would interest me, like the Beethoven concerti loosely attached to the instrument types that are appropriate. But no matter how one sticks to an “authentic” plan, there is always some kind of contradiction. For instance, what do you do with the Second Concerto in B , which was written for a 5-1/2 octave instrument but has a later cadenza written by the composer at the end of his life for a 6-1/2 octave one? And that is not all: the cadenza is not unlike sections of the Hammerklavier in character, a far flung style so incongruent with the elegant and almost decorous concerto. Someone who hates the Performance Practice movement could have a heyday with this, pointing out that consistency in style didn’t seem to concern Beethoven. As far as I know, it hasn’t been explored. Q: As an aside, I’ll just mention that my first recording of Beethoven’s First Concerto was the one with Glenn Gould in which he wrote and played his own cadenza. I don’t have the recording anymore, but I remember it being the most bizarre, incongruent thing imaginable. And Gould wasn’t alone among musicians who have gone over the edge and around the bend when it comes to supplying their own cadenzas. So, what do you do to resolve the disconnect you mention in Beethoven’s B -Major Concerto? A: I guess that I will have to have a 6-1/2 octave piano nearby and when the orchestra is playing the pre cadenza tutti, I will simply have to leave the 5-1/2 octave keyboard and go for that extra octave. Of course I’m joking. I refuse to become that fussy, or take it too seriously! Q: Somewhere in your last answer are the makings of a Victor Borge skit. What about your current recital activities and concertizing schedule. How do you balance that with your academic responsibilities? A: I am planning to return to Germany and Ireland where I have played concerts as well as given Master classes. Some East coast recitals are planned and of course a number of recitals and chamber music performances in Bloomington. As I teach piano performance majors one-onone I have flexibility to travel when necessary. Every four semesters I lead a Doctoral Seminar in Beethoven and Schubert which meets twice a week at a fixed time, so that is a little less easy for scheduling, but not impossible. I have been at Indiana University for 18 years now, so I have interacted with Doctoral piano students in that seminar nearly 8 semesters. I must say that the openness and intrigue with period pianos that has occurred over time is encouraging. Not just period pianos either, but the whole concept of informed performance is a more welcomed subject than two decades ago, due much to the pioneering work of Badura-Skoda, Holmquest, Bilson and a few others. Q: I’ve saved for last the most recent of your recording projects, a brand new performance of Books 1 and 2 of Albéniz’s Iberia for Schoodic. I understand that not just Iberia but a good deal of 20th-century Spanish and Latin American repertoire is somewhat of specialty of yours. In addition to performing the complete Iberia live, you’ve recorded Books 1 and 2 of Granados’s Goyescas and Volumes 1–4 of Nin-Culmell’s Tonadas. Has there been a previous recording of Iberia as well, or is this your first? A: My first year at the Juilliard School and living in New York, was needless to say, a big adjustment for a 17 year old mid-western kid. That was in 1967 and happened to coincide with the 100 birthday of Enrique Granados. In early December of that year, the superb, but not yet well known Spanish pianist Alicia De Larrocha was giving a recital at Carnegie Hall to mark the Granados anniversary. I was torn as to whether or not go to the concert or stay at school and practice for my lesson the next day, and it looked like I would opt to practice. Well, something pushed me and at about 7:40 pm I hopped on a bus down to 57th street, bought a ticket, and just found my seat as this extraordinary little woman began to play. I will never forget it and it changed my life forever. I had never heard this repertory, and soon made it mine to play. That was Goyescas, in some ways the Schumann of the Spanish idiom and more up my alley. The Iberia, much more Lisztian a work has come into my life only recently, although I have known every note of it for years. I believe I introduced a lot of my student colleagues to De Larrocha’s work, especially Garrick Ohlsson. But then Garrick won first prize at the Montreal Competition when De Larrocha was on the jury and they immediately became fast friends. Garrick was wonderful to introduce me personally to her and share her visits to his parent’s home in White Plains. I was still at the end of my teens, and I have a vivid memory of the three of us getting into a cab and going down to Greenwich Village to have a drink at the Granados Restaurant, De Larrocha leaving her card with the bar tender for the owner, in an attempt to locate possible Granados relatives. Also one night she took us into the basement office of the then new International Piano Archives of which she was the honorary president, and proceeded in this cramped dark space, to play for us The Maiden and the Nightingale on a miserable little spinet piano, making music the whole time. These meetings began a long but not frequent association and culminated forty years later in her coming at my urging and an invitation from IU to teach for a week in Bloomington. This was her last visit to the USA and the series of classes and her playing were unforgettable. We also had in common the friendship with Joaquin Nin-Culmell some of whose works I recorded for KOCH International classics along with Goyescas. When De Larrocha heard my CD, she was so forthcoming with encouragement for me in this repertory. That was the year her recording of Goyescas received a Grammy, and mine was short-listed. That was enough of an honor for me! These recordings are my first attempt at Iberia. Q: For someone so closely associated with 19th-century mainstream European repertoire and period instruments, interest in Albéniz and 20th-century Spanish and Latin America composers seems like quite a leap. What led you to this body of work? I understand that Messiaen had something to do with it. Care to explain? A: I played for Messiaen when I was about 22, a concert in his honor at which I performed the Quatour pour le fin de temps. Both Yvonne Loriod and Messiaen were humble and adorable people. He wrote me a testimonial that was quite extraordinarily complimentary and in our conversation it came up that I was learning Goyescas. He urged me to also play Iberia, which he considered to be the greatest piano masterwork of the 20th century. He seemed to think that this would be a great vehicle for me and that it was something I must do. Took me a long time to finally come to terms with it, but I remember his insistence as if it were yesterday. Q: I understand from everything I’ve read that Iberia is one of the most fearsomely difficult works in the entire solo piano repertoire, so difficult, in fact, that Albéniz himself, I’ve heard it said, was unable to play some of the passages he’d written. Even the notation presented such problems that in places it had to be written on three staves. Can you elaborate on the technical, as well as interpretive, challenges of the work? A: You are absolutely right about how fearsome it is. Maybe the hardest part is getting past the jungle of notes and still trying to make music. This work is so atmospheric, so picturesque, it is easy to forget that underneath is a seething passion and loneliness that is Spain, besides all the revelry and all the Moorish references. I think probably Messiaen in his appraisal of this work was considering the incredible range of emotions, color, pianistic challenges and the masterful shape and originality of the material that make the canvas so totally comprehensive. Possibly that’s why I have waited so long to approach it. Q: The work in its entirety, of course, is in four books. You’ve plans to record Books 3 and 4 for Schoodic in the near future as well. Is that correct? When can we look forward to its completion? Q: This would seem to cement your new recording relationship with Schoodic. Beyond Books 3 and 4 of Iberia, any long-range projects on the horizon? A: Right now I can’t see too much further than finishing Iberia, but then I do hope to get onto that Schubert we spoke about at the outset of this stimulating discussion. That has kind of whetted my appetite—all that Schubert, a composer for piano still somewhat in the minority, undeservedly. I think things have improved for him thanks to Brendel, Schiff and others, and of course earlier, Schnabel. Did you know that as great a man as Rachmaninov was shocked to learn from Schnabel (the story goes, at a NY cocktail party) that Schubert had written any Sonatas at all!!! Surely there must be a bit of exaggeration here, but that is how it has come down to us. Despite its well-known formidable difficulties, Albéniz’s Iberia has been tackled and conquered by a number of pianists. For many years, Alicia De Larrocha was probably considered the work’s leading exponent, but recently, Artur Pizarro for Linn, reviewed by James Miller in 34:1, Marc-André Hamelin for Hyperion, and Eduardo Fernández for Warner Music Spain, the latter two reviewed by me in 29:1 and 34:6, have surmounted its technical challenges and brought fresh insights to its panoply of pianistic colors and textures and to its myriad ethnic and cultural aspects. Edmund Battersby now joins this elite company in a performance of the first two books of Iberia that explores not only Albéniz’s ear for tone-painting but the deeply felt personal connections the composer had to the Spanish land and its people. The number of undergraduate and graduate theses that popped up on a Google search of Albéniz’s Iberia quite surprised me. The work has been subjected to exhaustive research and analysis that trace its musical roots and identify the composers who influenced its harmonic language, not least of which was Debussy. An extended suite made up of 12 numbers, Iberia is spread over four books, each containing three pieces. Because of its layout, the books can, and often are, performed independently. There does not appear to be some connecting thematic link between the pieces or a systematic scheme of key relationships that unify the individual numbers into an integrated cycle, though it might be pointed out that Albéniz does seem to favor certain keys—F♯-Minor, B♭-Minor, and D♭-Major—which he uses more than once. Whether this is significant or not, I don’t know. The three numbers that make up Book 1 are (1) Evocación , which presents an overall impression of Spain, drawing upon melodic and rhythmic elements of the southern Spanish fandango and the northern Spanish jota ; (2) El puerto , inspired by Spain’s port city of Cádiz and based on the zapateado , a dance of Mexican Indian origin; and (3) Fête-dieu à Seville , alternately known as either Corpus Christi or El Corpus en Sevilla , which portrays the Corpus Christi Day festival in Seville. It is the longest piece of the set, almost as long as the first two numbers combined. This is because Albéniz weaves together a complex tapestry or musical threads consisting of a march, a saeta (a somber Spanish religious song), an Andalusian cante jondo (a form of vocal flamenco), and a tarantella, which concludes with Albéniz’s signature fffff dynamic marking. But after the big bang, the piece ends on a quiet note ( pppp ) to the piano’s impression of tolling church bells. The three numbers that make up Book 2 are (1) Rondeña , inspired by the Andalusian town of Ronda and based on a type of fandango that alternates bars of 6/8 and 3/4; (2) Almería , titled for the Andalusian seaport of the same name, and based on the tarantas, a type of mining song believed to have originated in the Almería region, and (3) Triana , named after the Gypsy quarter of Seville. As stated above, Edmund Battersby finds much more in this music than just the local colors and flavors of Albéniz’s native Spain or the opportunity for brilliant virtuosic display. The composer had deep emotional feelings for the land and its complex mix of Roman, Moorish, and Jewish cultures, and he managed to imbue the pieces of Iberia with his loving affections. This, above all else, is what comes through as I listen to Battersby’s readings of these remarkable scores. Scholars have devised all kinds of routes to establish the “correct” way to play the music of composers who lived before the age of recording. One of the best methods, and one that is becoming increasingly common, is to play the music on instruments contemporaneous with the composer. In this case, Edmund Battersby, a professor of piano at the University of Indiana, performs on a replica of a pianoforte built by Conrad Graf in Vienna in 1824. Both of the composers on this disc would have been familiar with this keyboard. The difference in tonal weight and color is subtly different from that of a modern grand, but unmistakable nevertheless. For the performer, the biggest contrast is in the way texture is rendered. On the smaller and far less tautly strung pianoforte, polyphonic passages are unusually clear, and the voicing in large chords is more vivid than one hears on a modern instrument. All of this would be for naught if the pianist did not have the skill and artistry to match the music, but Battersby is fully up to the task. His Chopin is refreshingly devoid of histrionics; there is enough drama and beauty in the music itself, and Battersby knows how to stand back and let the composer do the talking. In the two great Ballades, the lucidity of the piano’s sound makes the harmonies and dissonances stand out with special clarity, and Chopin comes off as an even more adventurous composer than he does on a present day instrument. Schumann’s masterpiece Kreisleriana can never sound anything but adventuresome and volcanic, yet for me, the most delightful moments in Battersby’s performances are in the languid slow sections, which he delivers with great poetry and control of color. all new recording "From Iberia"